Once you receive your artificial turf for your indoor sports facility, it is time to make sure it is installed correctly. 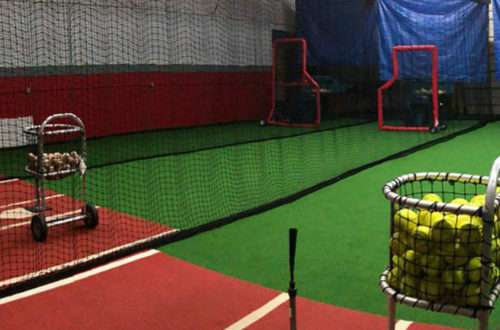 On Deck Sports recommends using one of our professional installation teams or a professional carpet installation team for the best results. If you do choose to install your turf yourself, follow these steps to ensure the best application and longest life for your turf. The sub-flooring surface must be fully cured and washed with successive rain or wash waters to remove all excessive chemical materials used to form or cure the surface (alkali, soaps, emulsifiers, oil substances). Proper curing time will range from 45 – 60 days after sub-flooring installation. The sub-flooring surface must be thoroughly cleaned which should include sweeping, vacuuming and mopping to insure that all dirt, paint, grease, oils or any contaminants which will prevent good adhesion are removed. The carpet should be allowed to lay out unrolled and allowed to relax at least one hour before installation. Ideal temperature for the installation to take place is 55 degrees Fahrenheit to 95 degrees Fahrenheit, and the relative humidity should fall between 10% and 65%. The carpet should be pre-cut for each area allowing some excess for proper seaming and edging or any trimming necessary. The adhesives should be stored in an area that maintains a temperature between 65 degrees Fahrenheit and 85 degrees Fahrenheit. The adhesive should be spread on the sub-flooring surface that covers an area approximately one-half the actual size of the carpet strip being glued. The adhesive should be applied using 1/8 x 1/8 x 1/8 V-notched trowel for smooth backed or action-backed carpets and a 1/8 x 1/8 x 1/8 U- or Square-notched trowel for rough backed unitary carpets. The 1/8 V-notched should apply approximately 10 – 12 yards per gallon, whereas the 1/8 U- or Square-notch will apply 7 – 9 yards per gallon. Of course, the variations in the sub-floor surface will affect the final coverage rate. Once the carpet has been properly joined to the sub-floor, the entire area should be rolled using 50 – 75 pound roller for unitaries or action backed carpets and a 35 pound roller for urethane cellular attached form backed carpets. The floor covering should be rolled in both E-W, N-S directions to assure proper bond. All carpet seams should be sealed by placing a 1/8 inch bead of seam sealer (nonflammable) at the interface of the carpet fiber and the primary-secondary backing. The two carpet edges should be butted together to assure even placement and complete seam sealing. The seam sealer can prevent tuft lose, raveling, and even waterproof the carpet seam edges. In the event a bubble should develop, do not ever cut or slit open the raised area or bubble. Most bubbles are caused from solvents left in the adhesive and trapped under the carpet during lay-in. The best way to remove and correct these bubbles is to puncture the bubble with an awl, ice pick or hypodermic syringe and press the trapped solvent gas vapors out of the bubble by pressing and squeezing the area with both hands. Allow the carpet to lay back into the adhesive and either sand bag or re-roll the area to develop maximum bond strength. If, for some reason, the bubble does not re-bond adequately, the hypodermic syringe can be used with a small quantity of the seam sealer to re-bond the carpet to the floor. After the seam sealer has been injected into the bubble, spread the sealer by hand rubbing and then allow it to air dry for 5 – 10 minutes before rolling. How do you know whether your turf is the action-backed vs other type backing noted in the instructions above? We bought the arena turf and I do not see that info in the description anywhere. Trying to figure out how to apply the adhesive, based on instructions above. Action-backed is generally our unpadded turf with the rubber feel. If it is a padded option with the felt on the backing, it is not action-backed. Hope this helps. If you still have questions, please feel free to reach out to info@ondecksports.com. Thank you.